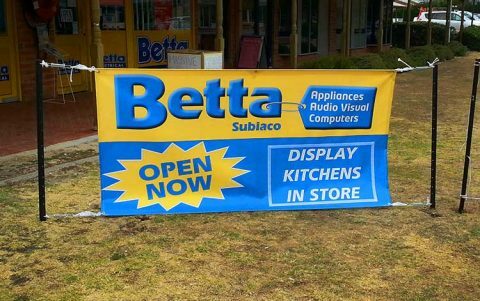 Every business uses banners and Perth Graphics Centre is leading the way on price, quality and service. Whether it’s a single sided banner, or a double sided banner, Perth Graphics Centre can make it. The reason so many people get PGC to manufacture their banners is simple: we are Perth’s leading banner shop and we do them at Perth’s best prices. No doubt, you’ll have seen our special on a 2m x 1.2m banner but with our large format digital printer we can make them at literally any size. If it’s a banner to cover a building, or just a “Now Open” banner, we can do it. And with our fast turnaround and excellent service, it’s little wonder people are trusting their banners to Perth Graphics Centre. With high quality canvas and reinforced eyelets, our banners stand up to Perth’s harsh weather conditions, too. So if you need a banner, then please get in touch with us and we’ll take care of your banner requirements. measuring 2.5m x 1.8m, printed with a full colour photo image.